Ok strictly speaking this is not a building as such but an area. 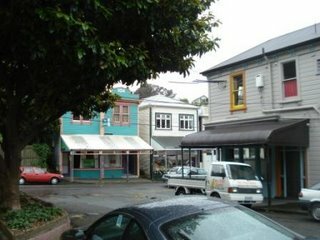 I felt that in a previous post, showing typical images of Welly, the more traditional timber buildings were not fairly represented. 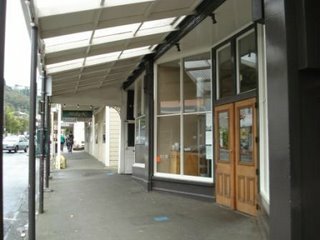 There is a side to Welly that I didn't capture and I hope to even things up in this post. While I was out jogging, yes that's right jogging, New Years resolution number one can be ticked off! I came accross a suburb of Wellington called Te Aro. 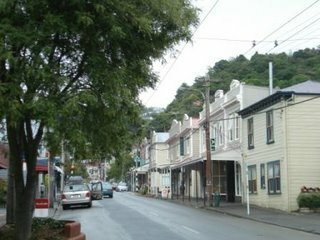 It is a narrow strip that runs between the city centre and further outlining areas such as Karori. 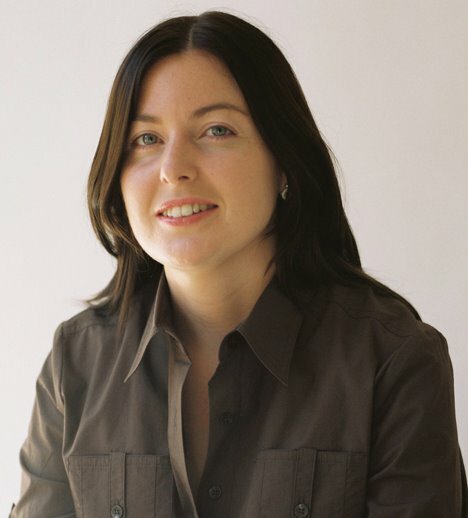 That won't mean a whole lot to ye so we'll move on. If I had collapsed and later come to, which was a strong possibility as I was nearing the end of my jog, I would have been forgiven for thinking that I had awoken in some part of Nantucket. OK maybe Hyannis Port to be fairer to Nantucket. 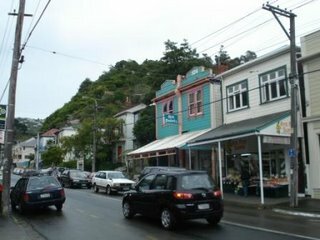 Te Aro is a fantastic little village with a bakery, veg/ florist shop, cafes etc. and has a wonderful feel about it so I decided to make it my "building" of the week. Unfortunately the weather wasn't great but here are some damp pics in any event. The timber buildings are common over here as there was plenty of the building material available and it made logical sense to use it. 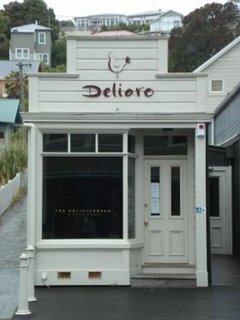 Just in case any body is interested in an actual building of the week the following picture is of a little deli in the heart of the village. People, quite rightly, go on about good proportions all the time in design and I think this building is an example of that. 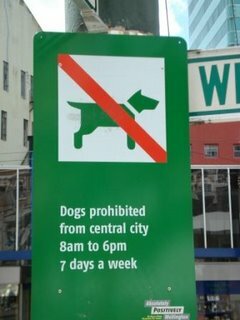 When we were walking around Welly generaly we came across the following signs. It appeared on the surface of things that dogs are not the most popular animals in the city, at least not during working hours. See pic below. If you are a dog lover however perhaps Te Aro is the place for you, along with the cafes etc. 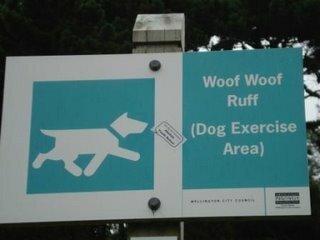 that cater for all your needs, it appears to be a more canine loving place as the poster in the local park shows. I just hope that all my jogs are as rewarding!